I’ve never let the pain get in my way. Or the wheels. (Sometimes I feel like a spider, a girl with 2 arms, 2 legs, and 4 wheels equals 8 limbs. Have you seen Monsters Inc? I ‘roll’ by my self like freakin’ Mr. Waternoose.) I do amazing things, and they’re almost bright enough to hide the pain of living, even from me. I have been so busy, I actually don’t have time to be sick. Illness is a major inconvenience! Who needs pill breaks and resting and insomnia? I don’t let anything stand between me and living fully, especially not being sick, but it requires a re-evaluation of life, changing the definition to suit your needs. Exchange the cloak of pain for a smile, and put the tension in your back pocket for a time. But like every magic tricks or slight of hand, the reality behind the make-believe can’t be hidden from the magician. I can’t figure out the best way to list all the amazing things I’ve been up to without sounding really conceited and irritating. And I can’t figure out a way of talking about the bone pain without feeling like I’m hosting a whiney pity party. Which is why I am writing all this bizarre preamble. I guess. I don’t know. Sometime my fingers take my brain for a walk. Um…I actually started writing this post because I wanted to talk about the Greek and Roman studies class I was taking at UVIC. See….you can never trust your fingers, because they take you places that your terribly logcial mind would not. Without further ado…I’m auditing a class at UVIC (my 3rd so far! ), called ‘Jews and Christians’, which is every bit as rich in primary sources and apocryphal books of the bible(s) as I was hoping! I’ve also been studying latin for the past 1.5 years, and it’s marvellous! I only wish I’d learned it before tackling French and Spanish, and Biology (and music! and literature! ), because so many of these words and terms have latin roots. Although the meaning of words have changed sometime during their multi-millennia trek from Latin to English, knowing the root of words help to understand their meaning. Can’t wait to start reading Juvenal’s satires & songs of Horace, but I’m definitely not there yet. The teacher of both these classes has the sort of passion for his subject that I was starting to believe was impossible with adults ;). We met Dr. Rowe at a thrift store and started chatting in line about Lyme disease. I learned that he was a professor of Greek and Roman studies at UVIC, and when he asked if I wanted to audit some classes, I was so surprised, and excited. My love of Roman and Greek mythology started at an early age, when a family friend & librarian gave me children’s version of Greek Mythology, ‘In the Morning of the World’. When I grew a bit taller and could reach the top shelves of the library, I found Robert Graves’ Greek Mythology tomes, which are a beautiful rendering of a culture’s complicated myths. I’d wanted to learn more about Greek & Roman philosophy, history, and religion at university, but I never dreamed I’d be able to handle the coursework, or keep up with note taking, or even make it classes. For whatever reason, I can ‘learn’ Latin in the way I just can’t learn any other subject, with the exceptions of Music and Spanish (a different part of my brain? who know!? who cares!!). I still struggle with severe short-term memory impairment, which makes it fun when I know no ones name, or if they know me. So my secret is you treat everyone with kinds and with an open heart, and figure out from their facial cues whether or not they know you. It’s hard for me to think of answers abstractly to Latin grammar questions (I hate & spurn grammar. Could you tell? ), but if someone asks me a question and I don’t think about the answer, it is there, waiting for me to express it. I love translating Latin…it feels the same as working out an advanced Suduko puzzle. ; you solve little pieces and get a glimmer of how it all goes together, and then all at once you’ve solved the meaning of the sentence, filled in all the numbers. Last night, instead of going to bed with cold-to-the-touch-numb-to-me feet, they were a shockingly normal color. We have taken pictures of my feet when they are a purple-bluish or red color, which usually doesn’t show up in a photo well. My feet started turning strange colors when I first became ill with bronchitis/pneumonia in 2008, at the very beginning of my serious Lyme illness. There was some talk about Renaud’s syndrome, but my feet weren’t turning colors in the right order, so that was quickly ruled out. My hands and feet were always cold, but now, just 2 days after the CCSVI procedure, with unblocked veins, the warmth and feeling are returning to my limbs. It is kind of exciting…I hadn’t realize I had lost so much sensation in my limbs, if not all of the feeling in my legs. Maybe sooner it will be easier to walk. Who can say…? It is going to be a brilliant full moon tonight. The tide is very high. Most people have seen scientists projections of what the future water-levels will look like. Its not very promising for shore-dwellers, and the major cities set by the sea. At around 5 o’clock, at the busy Aliso Beach, 20 minutes from where we were staying, the waves were coming in so fast and furious that picnickers and sunbathers had to jump up and flee the tide. It all happened so fast; one minute the sea was a few hundred feet away, and over the course of what felt like a few minutes, it was up to the sidewalk. The water came up and over into the parking-lot, leaving behind much debris and sand. Another thing we have noticed here is how much erosion there is. It is very dry at this time of year, and although bougainvillea and cacti cling to sandy banks, not much is holding back a slide in the wet-season, or preventing the houses perched precariously at the hill top from falling into the sea. Cement and mesh is often tacked to the sheer ‘sand-faces’ (what probably was a rock face a few years ago). I am used to drought from living in both Northern California and then Vancouver Island summers, but because the landscape isn’t ‘green’, it feels so much more serious. I suppose it is just as well that less people live down here; less demand on limited water resources. But I guess flooding fields to grow almonds and other veggies use up plenty of water in the region. Maybe its the warm weather coming into play, but everyone here seems very ‘relaxed’ for California. The pace of life doesn’t seem to hectic. There aren’t that many people living here, the congestion no where near as much as San Francisco. The air is cleaner down South too, which I only hope lasts. There really is something to the saying that a sea breeze cures sickness. Maybe its just that it feels so damn good listening to the waves, letting them lull you to sleep. I think I read something about the fact that minerals are beaten out of the rocks by the waves are released into the air, which makes the air feel so good to us. When we realized that all of the sand (and parking lot!) 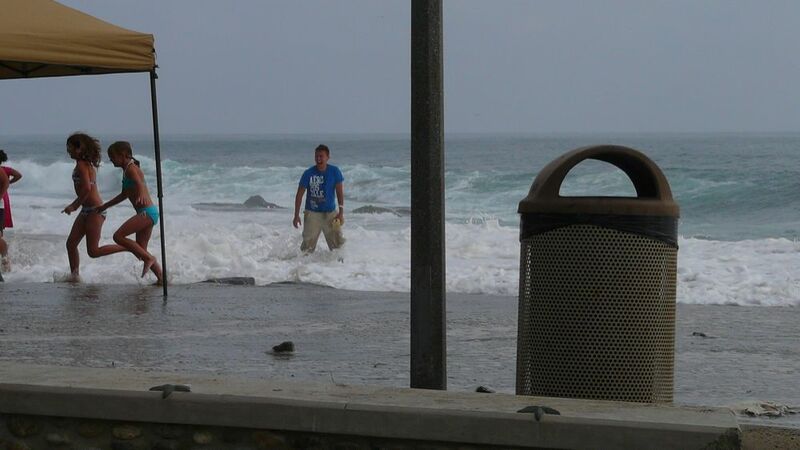 at Aliso Beach were quickly flooded by the waves, we decided to head to another spot. It is fast becoming my local favorite. 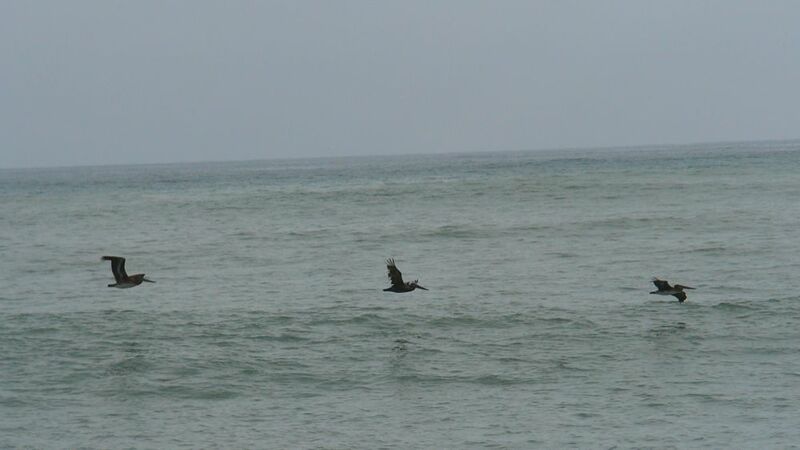 The beach is nearly deserted, and pelicans swoop by every now and again, landing with a ‘plop’ on the waves, ungraceful sitting as they are delicate in flight. Pelicans look so large close up, because they shrunk in size in my memory. They are practically the size of Condors! I’ve begun knitting my PICC line cover. 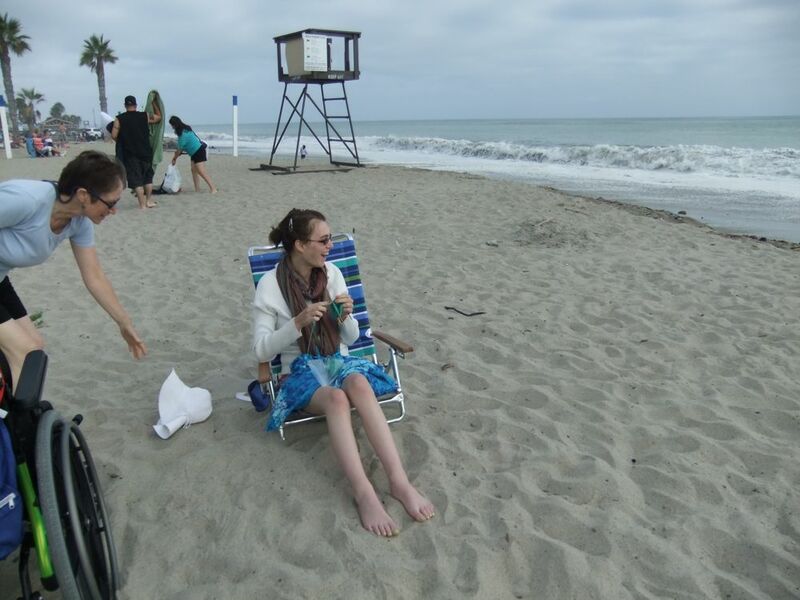 How deliciously normal it was to sit on a lounge chair on the beach, knitting, while the sun glares off very pale Canadian skin. I was a little cooler than I’d be willing to admit in the auditory world (e-confessions are fine of this nature…), hence the sweater, scarf, and sarong. But undaunted as the good little Canadian spirit and pride in me can be, I was determined to bury my feet in the sand, and watch the sun twinkle behind a cloud. Hey! – a twinkle is more than we can get in Victoria for several weeks…I’m not complaining! I feel like a 4-year-old when it’s time to leave the beach. “But I don’t wanna go” *insert a pout here Amy – my cuz – would be proud of*. The beach has a kind of magic that I am wont to give up. It seems like as soon as a plunk down in the car and start brushing sand from between my lime green toes that I have returned to another plane in the universe where I am very ill, and people have to take care of me. On the beach, my imagination is free.